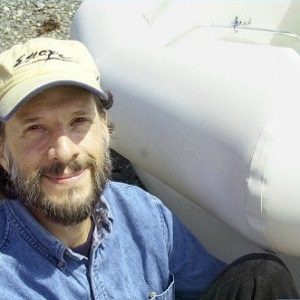 Steven Callahan is an American author, naval architect, inventor, and sailor noted for having survived for 76 days adrift on the Atlantic Ocean in a liferaft. Callahan recounted his ordeal in the best-selling book Adrift: 76 Days Lost At Sea (1986), which was on the New York Times best-seller list for more than 36 weeks. Summary: Steven’s answer to the five questions! Listen to the full conversation on the player above; also available on iTunes and Stitcher. One is the guy who taught me how to sail, who really taught me about personal responsibility and dealing with things. He was really the perfect mentor. He would let me get into just enough trouble to learn something from it, but never to put anybody in danger. Learning to deal with life yourself, not having somebody to come along and I always pick up my own trash. My parents did that. There was an old Lobsterman, an old friend of ours here, George Bracey. He went through incredible things during his lifetime. Those people are a great inspiration because they show you that the miracle does happen and that people make it happen. My life was in disarray. I was separated from my wife and so I set off on Pee wee Herman’s great oceanic adventure and left the United States with everything I had. I always wanted to sail across the ocean in a simple boat and to see what’s really possible to do with very little. I had a really great time going over to England and then things got a little rough. About a week out, something hit the side of the boat at night and it was a bit of a blow. It filled up with water and I bailed out in an inflated life raft about 6 feet in diameter and I went drifting across the Atlantic for the next 1800 miles. This is sort of a longer term experience and people tend to go through a number of different stages.The psychology in what happens to people, it gets to be pretty complex. It’s hard to cover it all, but I’ll give you a few examples of things that kept me going. In the initial stage, you’re escaping immediate threat and fortunately for me I had been out on my own in isolated environments dealing with problems with limited resources throughout most of my life both backpacking in the mountains and being offshore in a boat where you can’t just park it on the side of the road and hope that somebody’s going to come and get you out of the picture that you have gotten into. That was the training for that immediate stage because a lot of people can become frozen. About 15% of people become frozen in panic or just don’t know what to do. About 2/3 of people can be pretty functional, but need direction. About 15% of people are able to do this psychological sweating where they have enough training and what-not to be able to go through the steps of going through emotions. The second stage which is very difficult to get through – disorientation and fear I call it. Some people call it recoil. There’s not a lot more you can do, but your whole life has gone away and it’s like, “what now?” For me, it was like how can I even survive out here? It took me about two weeks to get through that stage and it’s really horrible. It’s when all those bad things in your life come back. All your failures haunt you, you feel like the most idiotic person to have existed, you really just beat yourself up. On the longer term, there are things like normalizing life as much as possible that kept me going. I tried to convince myself that it was not the end of the voyage. It was a continuation in a little bit more humble raft. Well today, I’m talking to you. I’m given those opportunities through having written Adrift and I go out and talk about it. I also write articles. I’ve written a lot about safety and survival and I’ve been involved with groups of people who deal with other kinds of survivors beside oceanic survivors. I do it through that, through writing and through working on these films. (1) Everybody has to find their own path. (2) Take things one step at a time. Don’t overwhelm yourself. (3) Expand your comfort zones. Take a little bit of risk.